Roll Out the Red Carpet for Yourself This Valentine’s Day! Don’t worry about how perfect their hair may look because trust me, you can do it yourself at home! I want to help you create a look for Valentine’s Day, whether you need to be restaurant-ready or at-home-effortless with your girlfriends enjoying a glass of wine. The trend of a bun has been seen for months now but some of us at Hair Republic | Salon can’t take the staple out of our hair wardrobe. Do you blame us? It is simple and easy even for someone who never plays with their hair. Here we have the top hair trend in the past year and how you can tailor it to your own style. 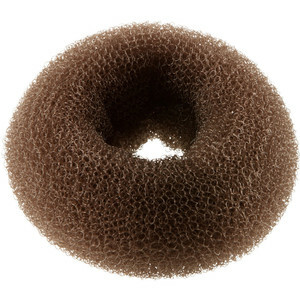 The easiest and quickest way, is to use a “hair doughnut” or “sock bun”. The gist of it is to place your hair into a tight pony tail, however high, low, or to the side you want. Next, you wrap the end of the ponytail around the hair doughnut and continue rolling the doughnut all the way down to the base of the pony. The best part is how sharp you can look with a bold lip colour, such as Lauren Conrad pictured above. Hanging out with the girls, running errands, going to class, last minute date? You don’t have to feel the need to dress up and a messy bun will be the perfect touch! As someone who juggles school, work, a social life, and trying to keep up with the trends, I am never surprised at the compliments I receive when rocking the bun. This hair style is a solution to my every day life! After practicing once or twice, you will get the hang of it – I guarantee. Create, discover, play around, add your personal touch, no need for step by step directions! And let me tell you, these starlets come home at the end of the day, just like us, and probably put their hair in a less chic bun.